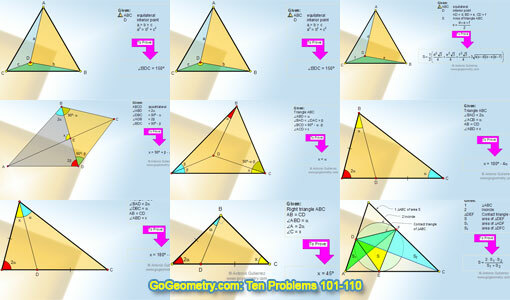 Proposed Problem 101.Equilateral Triangle, Pythagorean Theorem, Angles. Proposed Problem 104. Angles, Triangle. Proposed Problem 105.Angles, Triangle. Interior Point. Proposed Problem 106. Angles, Triangle. Cevian. Proposed Problem 107. Angles, Triangle. Cevian. Proposed Problem 108. Angles, Triangle, Median. Proposed Problem 109. Angles, Right Triangle, Cevian.